678 South Ave.256-1324, harrygsdeli.comMonday-Friday 8 a.m.-10 p.m., Saturday 10 a.m.-10 p.m., Sunday 10 a.m.-5 p.m.
My tax worksheets this year were a little bit hard to read by the time I actually got around to filing on Monday morning. On one corner of the first page of my 1040 form was a mustard-colored blot obscuring the signature block. My Schedule C was spattered with tiny dots (and not-so-tiny dots) of au jus, the paper warped and a bit smeared. The estimated tax vouchers were a complete loss — destroyed when I put a grilled sandwich (transparent spots on the paper) with cole slaw (whitish yellow stain with a tiny bit of carrot), pastrami (smear of fragrant meat juice and pepper), and Russian dressing (orange stains) down on it to answer my cell phone. Such, I guess, are the hazards of reviewing your taxes at a superlative sandwich shop like Harry G's New York Deli on South Avenue. At this time of year, like just about everyone else, I'm painfully conscious of money and how I spent it in 2012. As I sat at home looking over piles of twisted, folded, and torn receipts I noticed something interesting. In terms of value for price there were few — barely a scant handful — expensive restaurants where happiness and satisfaction were in any way proportional to price. On the other hand, at the other end of the price spectrum were a host of restaurants delivering generous portions of delicious food at modest prices. Which, I suppose, is how I came to be dribbling au jus on my Schedule C at Harry G's one afternoon. Harry G's New York Deli is a perfect example of a restaurant that delivers excellent value for the price. 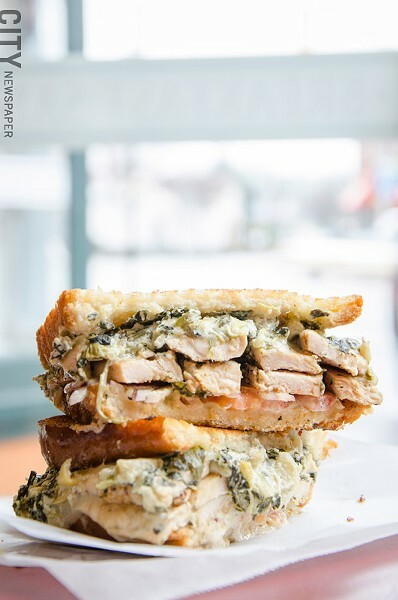 Owned by chef Brandon Greenwald and his in-laws, Mary Beth and Frank Giglio, and open only since May of last year, Harry G's serves up almost grossly overstuffed sandwiches at prices that are probably the envy of other sandwich shops in town. Based on excellent cold cuts, good bread (probably Martusciello's rolls, from the look of them), and backed up by salads, stocks, and sauces that Greenwald makes from scratch, the menu at Harry G's is well thought-out and well-executed. If the chef errs at all, he does so on the side of trying to put too much between two piece of bread. Take the portobello mushroom panini ($8), for instance. A stellar vegetarian sandwich tailored, Greenwald told me, for the large number of vegetarians who haunt the South Wedge, this sandwich is simply too large to eat with anything but a knife and fork (and a large stack of napkins). The sandwich is made with slices of grilled portobellos, red onion, fresh tomato, and a remarkably large amount of basil mayo topped with fresh mozzarella and then passed under a true panini press. The combination of flavors is exceptional and the portion is more than enough for two people to split — even if they don't get a side of potato salad or some crunchy sweet-potato fries with a side of honey butter. But there's no way anyone could ever successfully pick it up and eat it without completely destroying whatever clothing they were wearing. That said, the combination of mayo, mushroom marinade, and caramelized tomatoes and red onions that fell out on the waxed paper under the sandwich was so good I considered picking it up and licking it. More manageable, but no less tasty, was Greenwald's Cherise sandwich ($8.99). Pastrami, Swiss, cole slaw, and Russian dressing grilled on marble rye, this analog of the classic Reuben sandwich brought a welcome peppery and creamy accent to a sandwich that I honestly thought couldn't be improved upon. While some might quibble with the pickle — real delis down in New York City only serve half-sours rather than the fully "done" garlic dills they hand out at Harry G's (real delis also wouldn't put Swiss cheese on a meat sandwich, which just shows how wrongheaded they are) — no one could reasonably deny that this combination of ingredients is inspired, possibly by a Higher Authority. I suspect one of those who might take issue with mixing meat and cheese on a deli sandwich would be Greenwald's grandmother, whose recipe for both chicken soup and matzoh balls are used in Harry G's kitchen. As with all good chicken soups, this one starts with whole chickens and fresh vegetables, cooked low and slow until the remaining broth could probably revive the dead and would probably restore those who have given up hope to vigorous life. 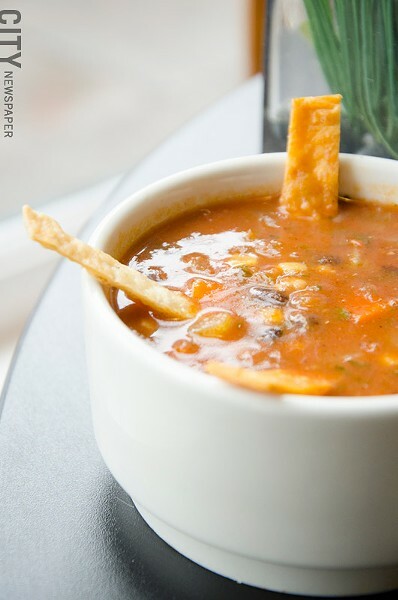 Greenwald's soup is squarely in the tradition of matzoh-ball soup pretty much everywhere. While I was hoping for the elusive, and perhaps illusory, fluffy, light matzoh ball, the three kneidlach in my soup (which Greenwald says he is still experimenting with) were dense and heavy enough to be a meal in themselves, not at all unpleasant, but not my favorites by any means. Many people speak with reverential awe of Harry G's Pittsburgh sub, which Greenwald told me is the restaurant's best seller. But I think the best thing on the whole menu is the French Dip sub ($5.75/half, $8.99/whole). I first had a French Dip when I was only 7 years old, and I remember thinking then that it was the apex of the sandwich maker's art. Until I had this deceptively simple combination of sliced roast beef, melted provolone, and garlic-herb mayonnaise on an excellently toothsome roll at Harry G's, I'd never had a version of the French Dip that lived up to my fond childhood memories. 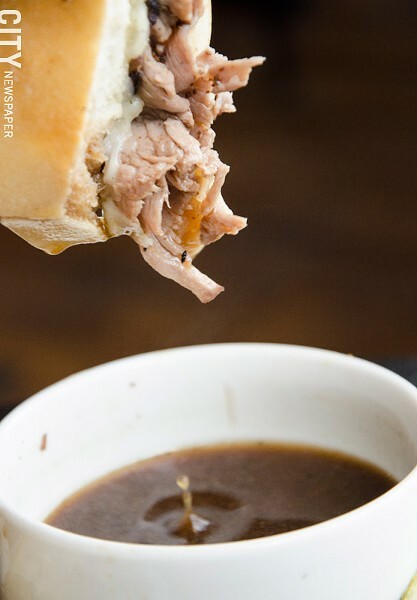 Greenwald's version, accompanied by an au jus that's not homemade, but is certainly jacked with some additional ingredients, is nothing short of sensational. 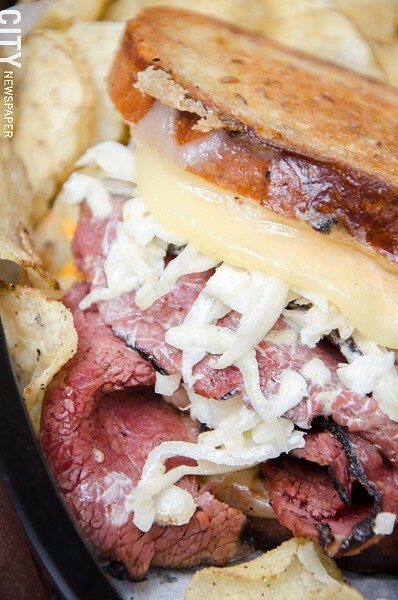 The garlicky goodness of the spread, the admirable rareness of the roast beef, and the burliness of the roll all combine to make the perfect sandwich for a chilly afternoon. And the modest price tag for the more-than-generous "half" sandwich is a definite salve for a wallet recently decimated by the Tax Man.